Lovely quiet cottage set on lifestyle block with many chickens and sheep. 3 minutes driving to fabulous Waiotahi beach and only 10 minutes into Opotiki for cafes, murals and the famous opp. shop trail. Handy for Motu Cycle Way. Ample on site parking. Lovely free-range eggs, home-baked bread with home made preserves, fruit off our own trees in season. Peace and tranquility - leave the city behind. Check in time 4.00 P.M. - 6 P.M. Check out <10.30 A.M.
Shower with seat and safety hand grips. 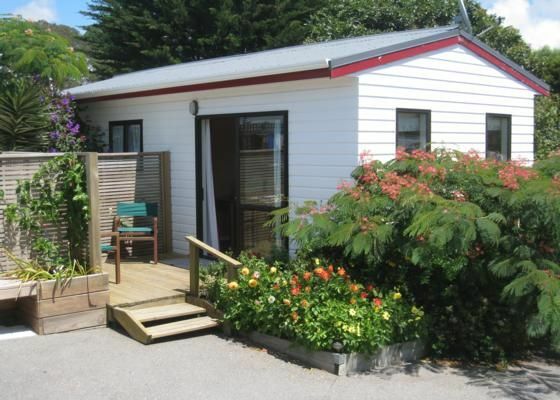 We are only a short hop from the fabulous Waiotahi beach. Great for fishing and for beach/water activities. You will be staying on a working chicken raising farm - many friendly chickens and a few sheep. There are also 2 dogs on the property who love to come and visit. An electric heater is available in the cottage for those cold nights. There is also an electric blanket to make your bed nice and toasty. Plenty of secure off-street parking. Bar sized fridge including ice box. The stove is an under bench type which includes 2 hotplates and a small oven. Electric oven included in under bench stove unit. Ample dishes and cutlery for 2 people. Fully equipped kitchen with fridge and under bench stove. The dining area is part of the open plan layout and for outside eating there is a deck with table and chairs. Cottage is surrounded by gardens. Small deck at entry way includes table and 2 chairs. If you want to have a true country experience, stay with Bruce and Chris. It is super comfortable, with lovely gardens. You will feel the beauty and quiet of the the countryside. With fresh homemade bread in the morning, what a great stay. Thanks Chris and husband for the hospitality, for the travel tips and specially for the fresh bread in the morning! Highly recommend. Delightful cottage on small acreage. Clean, modern, and delightful hosts. Homemade jams, fresh bread straight from the oven. An mémorable expérience in the rural NZ! All you could wish for in a holiday cottage for 2. All you could wish for in a holiday cottage for 2. Very clean, tasteful decor, relaxing indoor outdoors. Met by Chris who left us homemade fruit cake for afternoon tea. Breakfast was homemade fresh fruit juice, fresh warm bread, spreads, milk cereal and free range eggs, what more could you want. 2 very friendly and well behaved dogs, chickens, cow and sheep add to the real feel of the countryside. Beach is a few minutes drive away. A wonderful way to end out East Cape tour. Highly recommend. We are located in a rural area but not too far from the township of Opotiki for shopping and general services. An ideal spot for the local Motu cycle trails, beach activites, bush walks and the Opotiki museum.